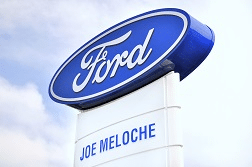 Joe Meloche Ford opened on Joe's birthday, July 11th, 1986. Joe Meloche Ford is a multi-time Ford Motor Company President's Award Recipient as well as the prestigious Diamond Award Winner which recognizes outstanding customer service by Ford Motor Company. Joe Meloche Ford is a certified Roush Performance Dealership! The dealership is located in beautiful historic Amherstburg, on the corner of Sandwich St N and St. Arnaud St.
Joe Meloche Ford is the only local Ford dealership in Amherstburg, also serving customers from Lasalle, Windsor, and Essex County. Our Ford Certified Sales Consultants can help you with your purchase or lease of a New or Pre-Owned car or truck. We have a fully Ford-Trained Service & Parts Department. We also offer a detailing department and are an Accredited Test & Repair Facility for Ontario Drive Clean. We look forward to helping you with all of your AUTOMOTIVE NEEDS. Visit us in Amherstburg- You'll love it here! Stop by Joe Meloche Ford Sales for all your Ford service needs. Questions? Any of our knowledgeable service and sales people can help. Call 888-568-2420.